Your Next Printer: Inkjet, Laser, or All-In-One? So you're in the market for a new printer. Here are some tips to help you decide. An all-in-one printer seems to be the de facto standard for all but the tightest budgets these days. But it's not the right choice for every one. Laser technology is ideal for black text or graphics. It uses heat to fuse tiny dots of black toner to paper, creating a crisp and fade-resistant image of an all-black document or greyscale picture. There’s no “bleeding” as there can be with ink. High-volume print jobs are handled better by laser printers. Laser technology is inherently faster than inkjet, and a laser toner cartridge prints ten times more pages than an inkjet cartridge. On the other hand, some bleeding is desirable when printing high-quality color images, like family photos. In nature, liquids blend together to form new colors; they do not just trick the eye by juxtapositioning dots of primary colors, as color laser printers do. Inkjet printers also lay down primary colors only, but they bleed and blend just enough to produce more natural-looking colors. Glossy photo paper is designed for ink; color laser prints don’t look as good as inkjet even on the expensive, glossy paper. That brings us to cost, both upfront and over the printer’s entire lifecycle. A low-end inkjet printer may cost under $30; an entry-level monochrome laser printer costs $50. Consumer-grade color laser printers run between $150 and $300; the fastest inkjet printers are in the $100 to $250 range. As you can see, the difference in upfront cost is not that great, but it’s easily made up in the long-term costs of supplies and maintenance. An HP-branded black inkjet cartridge for an OfficeJet Pro 8610 costs $40 and yields about 2300 printed pages (about 1.7 cents/page). The color cartridges cost $30 each and yield 1500 pages (2 cents/page). But this $25 laser cartridge for the Canon MF236n laser prints 2,400 typical pages (less than 1 cent/page). SO over tie, your cost for inkjet printing will about twice as much as laser. The price gap between toner and ink narrows when you look at remanufactured cartridges, which can cost 25% to 70% less than OEM cartridges. It’s hard to compare cost-per-page in the remanufactured market because prices vary a lot from one recycler to another, and so does the amount of ink or toner supplied. See my article The Truth About Discount Ink Cartridges for my recommendations on suppliers for discount ink cartridges. And whether you go with laser or inkjet, always look for high capacity cartridges available because that will drive cost per page even lower. Some printer vendors unfairly try to prevent you from buying third-party or refilled inkjet cartridges. In my article HP Playing Dirty Tricks? I tell the story of my HP printer suddenly telling me that all of my inkjet cartridges appeared to be "damaged," and how I found a solution. A few caveats, though... If you live in a very dry area, or you print only on rare occasions, an inkjet may not be a good choice. Ink can dry up in dry, hot climates, and print heads may clog if the printer is not used on a regular basis. Laser toner is powder, so it fares well in a dry place. But in high humidity, pages printed on a laser can stick together. If you manage temperature and humidity in your home or office, these problems will most likely not be an issue. So what about a single-function printer version an all-in-one? As I said, the decision to buy an all-in-one version of a given printer model is really a no-brainer. Who wants to run to the office store to scan a document, make a few photocopies or send a fax? The price difference is minor, and the joy of digitizing all your paper clutter is immense. You’ll save money by not buying filing cabinets, folders, labels, and hours of time as well. [MATCH] Your Face Predicts Your Behavior? Is This the Most Economical Printer? A 3D Printer in Every Home? Is a Paperless Office Really Possible? 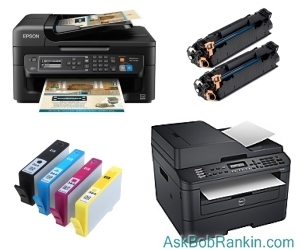 Should I Buy That Cheap Inkjet Printer? Discount Toner Cartridges - A Real Bargain? Most recent comments on "Your Next Printer: Inkjet, Laser, or All-In-One?" Avoid the Epson WorkForce WF-2650, it rarely prints well and when it does it burns thru $$$ ink rapidly. I own a color lazer printer, probably one of the first. There are no Windows7 drivers that I know of and it sits in my living room gathering dust and needing cartridges. Granted the cost of ink cartridges can be rather daunting. However, and "instant ink" option is offered on several HP printers which brings down the cost of getting new cartridges. The monthly fee is determined by the number of pages typically printed in a month. The cost is quite reasonable. I vote all in one!! Great convienence to be able to copy and scan especially with price differential so low. Bob, would like for you to give your ideas on refilling cartridges yourself. For me a there were 2 big factors that swung me to an OKI laser. 1)Linux compatibility and 2)Network so I can print from any device without needing to turn a PC on. It does duplex too. New toner is too expensive branded, I can buy 2 printers for the price of one high capacity set giving similar output, and get the new 3 year on-site warranty and all the other components are also new each time (waste toner container, fuser, etc that also need replacing). One day I went looking for am ink-jet cartridge for my Lexmark and came home with a whole new Epson T22 color printer for $8 LESS than the cost of ONE Lexmark cartridge! Refillable cartridges cost $20 a set from HongKong. My Canon D420 b/w Laser printer cost me $59 on sale... scans, copies and prints very well. I found re-manufactured cartridges which includes the drum, toner and everything "pop-out/pop-in for $11.32 each... for 4,000 copies! I find AUTOMATIC two sided printing to be a "look for" feature in any printer. Yes, Bob, just do the math! I work from home, and I do print, but I don't print at a larger volume. I had issues with inkjet cartridges drying up in my climate. The hassle alone was getting to me. I switched to monochrome laser, and it is a great fit for me. I can't recall the last time I needed to print in color, so I didn't need to spend extra for color laser. The laser cartridges last so much longer than the inkjet cartridges (even when they didn't dry up.) I also use an AIO, as scanning is very important to me, probably more so than printing. I know this article is about printer hardware options, but one of the other considerations with printers today is the use of various networking options and wireless standards, including options such as Apple AirPrint and Google CloudPrint. I print from a variety of devices besides Windows machines, including mobile phone and Chromebooks, so find myself using a few different options for doing so. I got fed up with HP products and buying ink cartridges all together. I bought an Epson Eco-tank which acts as a copier and scanner. I don't print a lot so haven't had to buy bottles of ink and it isn't using much ink either. What sold me was I can replace the red or blue ink individually instead of replacing an entire cartridge when one color runs out. The scanner is turning out to be more useful as I transfer paper records to PDF. I have almost all kinds -- mostly several years old and I just keep them working - currently about 7. I mostly use an old b/w laser printer for everyday printing - cheap and fast. I have a Brother color LED printer - expensive ink but very fast color printing but not great quality. I have several Ink Jet for various purposes including a wide one for my wife's projects and others for photos. Some are all-in-one so I use them for scanning also. After I upgraded to Windows 10 I found that my HP all-in-one became even more unreliable, the wireless feature just not finding the printer about 95% of the time. I decided to buy a Brother MFC-J985DW all-in-one as I do use all the features, even if rarely. I have been very pleased so far. I am still using the OEM ink, and think that these cartridges, usually less usage available than replacement ones, are surpassing the number of pages HP ink ever printed, so I anticipate even better from replacement cartridges. It is also more compact than the HP, and sits comfortably on a bookshelf, whereas the HP took up half of my desk space. Diann, Isn't is easier to put hundreds of photo on a DVD than print them all out. I imagine the photo paper cost would be huge compared to the cost of a few DVD not to mention the storage of all the paper photos. 400 million ink and 100 million toner cartridges end up in dumps each year. Inkjet printed paper is very resistant to recycling, as such papers mixed in with other recyclables will spoil the entire load that would have been made into newsprint and other recycled products. I worry about all-in-one printer-fax-scanner combinations -- or indeed multifunction anythings. For me replacement is more of a consideration than desk space, so I'd rather run the scanner in a filedrawer and let the printer take up whatever footprint it needs. Inevitably one of the components of an all-in-one will break down, crippling the gizmo or denying me the entire machine while it's being repaired. I have a Brother HL-2170W laser printer and a Canon scanner, both getting on in years but still workhorses. Last time I had to replace a printer the scanner was working fine, and I had no need for a fax. The experience warned me away from all-in-ones. Yes, there are times I'd like to print in color -- but nearly always black-and-white will do and is much cheaper. Another way of saving money is to reuse printing paper. For memos, notes, other internal uses the blank side is perfectly satisfactory. I agree with Bob that one's primary printer should probably be a color all-in-one. inkjet unit, with a built-in scanner and fax function, as there will always be a need to make a quick copy of a document, or send a fax (if you still have a landline telephone)or to print an important color photo or document. A good idea would be to have a simple monochrome laser printer as a second unit for most everyday printing needs that don't absolutely need color (recipes, news items and 'Ask Bob Rankin' columns, etc.) As stated in Bob's article today, the cost-per-page of a laser unit is much less that that of an inkjet device. Decent, 20-25 page-per-minute stand alone units (good enough for most household needs) can be bought for around $100.00, or so, at places like Costco, Sam's Club, Office Depot or Staples. It's worthwhile to invest in a printer that has duplex capabilities, so as to be able to print on both sides of a sheet of paper, and potentially cut one's paper costs in half. Such printers usually have the letter "D" at the end of the unit's model number. Another good feature to have is wireless capability, which will allow the printer to be used by all the desktops, laptops and tablets in the house. These units have a "W" at the of the model number. When shopping for a printer, it's important to be aware of other parts that may be needed to be periodically replaced, such as print heads or toner drums, in addition to the normal ink or toner cartridges. These parts can be rather expensive to replace, so if the computer is over five years old, it may be more economical to just buy a new printer, which will likely be faster, cheaper and under manufacturer's warranty, as compared to the old printer being replaced. The crooked philosophy of the inkjet printer manufacturer was selling the hardware extremely low and get their money back through the consumables. One set of new ink cartridges was close to buying a new printer. But Epson started last year to have serious (higher) hardware cost but sell the ink of 70 ml at the price of Canon's 7 ml. That's what I call fair. Brother followed and even Canon has now large ink supply. It works very well. Compliment to Epson as trendsetter! I purchased an HP Deskjet F2200 series all-in-one (no fax) printer at a Black Friday sale for $20.00 in 2009 and it still works great. Howard L: I understand your concern about "multifunction anythings," however, unless one is making dozens, if not more, scans, on a weekly, or even daily basis, then a typical consumer grade all-in-one printer with scanner will be sufficient for MOST users. In an all-in-one, the printer is the part that gets the lion's share of the work. And most home users, me included, often go weeks, if not months without using the scanner. The scanner portion of an all-in-one printer uses mature, amortized, technology that is generally relatively inexpensive and reliable, and reused from model to model and year to year, by all the printer makers. There have been no new major breakthroughs in scanning technology for years, and it will likely be the same in the future. That's why the selection of stand-alone scanners, especially flatbed units, sold at retail, is typically down to one or two units, if that, as compared to ten or more years ago, when Best Buy, for example, sold between five and ten units, for some years. As Bob Rankin says, the cost to add a scanner unit to a printer is minor, and generally adds only $25 to $40 to the price of a stand-alone printer. If someone is in a business environment, where scans are frequent and necessary, then an all-in-one printer from the costlier business/commercial lines from HP, Epson, Canon, Lexmark or Xerox may be necessary and desirable, otherwise a consumer unit should be sufficient for most users. I've seen such printers used regularly in some medical and law offices, in lieu of more expensive office units. Here in Australia, I have a Brother printer for which I purchased a continuous ink feeding system. The adapted cartridges and tubing to the ink tanks plus 100ml of red, blue and yellow and 300 ml of black cost Au$119. These inking systems available in many countries. Yes, I agree that H.P. is probably adding some kind of software to prevent anyone from using alternative ink. When I see an update for my old H.P. printer I ignore it because I'm sure they are adding some firmware to prevent me from using other-than-their-ink ink. These companies that make inkjet printers and the ink that goes with them make 40% of their profit from the ink alone. They don't want competitors cutting into their profit margins. I'm sure it's not just H.P. that is preventing us from using alternative ink. I haven't yet tried using other ink in my Canon printer. So I don't know if it will work. But eventually I shall give it a try. I have enjoyed reading your newsletters for a number of years. Thank for such great informative information. Currently my HP photo smart 310 all in one quit feeding my paper. I am so fed up with HP. They used to have a great product. The first one lasted 16 years. Since the original printer I have had two all in one One lasted 6 months HP replaced it. The second one lasted 6 months 2 days. They said sorry the warranty goes back to the original purchase of 12 months 2 days ago. I had purchased two at the time as HP changes ink models like they are going out of style. I did not want to be stuck with a lot of ink. So now this 3rd HP same brand as the last two quit. Now, I am stuck with this unopened ink. I need to buy another all in one but is will not be an HP. I looked at Epson 2 years ago but could not get the Epson to print a nice red Santa Suit. Who wants a Burgundy Santa suit. So I went back to the HP, but after 3 printers inside of 2 years no more. Does anyone have a good all in one printer that prints a nice red that you would like to suggest for my next printer?